If you are working with affiliate marketing, it is very important to find the right affiliate networks to join to get access to the best offers in your niche. You have maybe heard about the MaxBounty affiliate network. But is MaxBounty a scam or one of the legit networks worth joining? I have been a member of the network for a while myself. In this MaxBounty review, I will show you exactly what it offers, how it works, and who it is for, so you can easily see if it will be the right network for you. 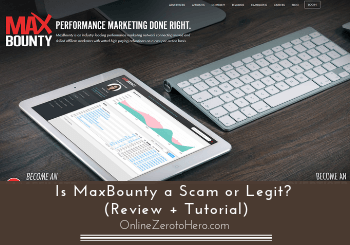 MaxBounty is a legit affiliate network. If it is for you, however, depends on the niche you are in and what kind of products you want to promote. It has a good amount of offers, is fairly easy to use, and the payout process is very good. So if it has programs within your niche, it is one of the networks worth considering. What is MaxBounty and what does it offer? MaxBounty is an affiliate network where you can find a lot of offers to promote if you work with affiliate marketing. It is mostly known as a CPA network (cost per action). It has existed for many years and is a trusted network. So it is definitely a legit network that will pay you – I know from personal experience. This does, however, not mean it will necessarily be the right network for you to join. It depends on your approach to affiliate marketing, the niche you are in, and personal preferences. So let’s go over more details about what MaxBounty offers so you can find out if it is the right network for you or not. What kind of products can you promote after joining MaxBounty? One of the very important things to see if an affiliate network is right for you is what kind of products you get access to promoting by joining and if it fits with your niche. So what kind of products can you then find to promote inside MaxBounty? You can actually find products relevant to many niches. Below you can see an overview of most of the categories the network offers affiliate programs within. Some of the categories MaxBounty has offers in. There are some niches it has more offers in than others. It, for example, has a lot of offers in the health niche, the dating niche, and in the financial niche. If you, on the other hand, are more in the internet marketing niche, it does not have so many relevant products. But as you can see in the image above, it has offers in quite a few different niches. MaxBounty accepts affiliates from all countries, so you can join no matter where you live. You can also find offers targeted towards most countries, so no matter your target audience’s location, you can find some relevant offers here. However, there are, of course, more offers to some countries than to others. There are most offers to the English-speaking countries but you will also find offers that can be promoted more or less worldwide. Be aware that you might not be approved if you do not have a website. This does, however, not mean it is not possible. It depends on your application. When applying, you need to let MaxBounty know how you will promote their offers. So it is possible to be approved even if you do not have a website but it depends on the situation. MaxBounty is fairly easy to use and it is possible to learn to use even if you have not joined affiliate networks before. There are a few steps you need to go through to get started and to find the right offers for you to promote. So below I will go over these steps so you can easily get started if you decide to join MaxBounty. The first step is naturally to apply to become a member. The application process is, however, a bit different than on most other affiliate networks I have joined. Usually, you just fill out an application online and will then get an answer. On MaxBounty there is an additional step. You also need to have a phone interview with one of the affiliate managers. You need to have a short phone interview to become a member. The image above shows a snippet from the MaxBounty FAQ section, and you can see that a phone/Skype talk is required for you to join. This might, at first, sound a bit scary but it is actually not. In my opinion, it is actually quite nice to get to talk to a real person before joining and already from the beginning get a connection. The interview is not very long and is over phone or Skype. It is just some questions and talk about why you want to join, how you want to promote it, what kind of offers you are interested in, etc. After the talk, if you are approved, you will get access right away. You can even yourself call the affiliate manager after you have signed up, and then everything can come into place the same day so the process is quite smooth, in my experience. After you get approved, you can browse through all the campaigns MaxBounty offers and find the right ones for you. In the menu in the members area, you can see an option called “search campaigns”. This is where you need to go to see what campaigns they have available at the moment. You will then see a long list of campaigns, and you can, of course, choose to go through all of these. This would, however, take a long time as there are thousands of campaigns. Instead, you can at the top of the screen click “search options” and you will then get access to a way to filter the results. Use the search options to quickly find relevant offers. 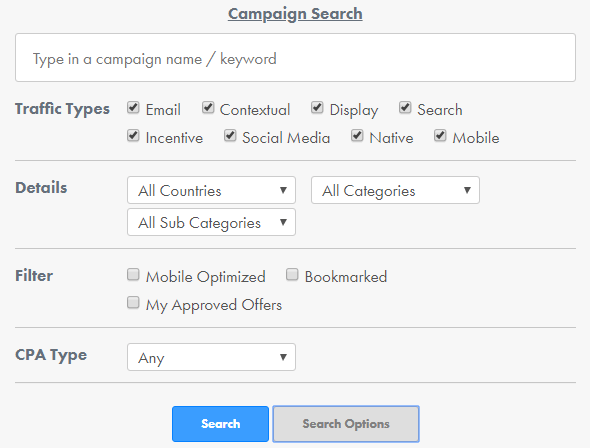 Here you can, for example, filter on countries and only see campaigns that can be promoted in certain countries, you can filter by category, traffic method allowed, you can search for a specific campaign name, and more. This is an easy way to get a quick overview of relevant campaigns for you. In the overview, you can see what you will get per lead if you get paid per lead or percentage of sale and what type of traffic is allowed. You can click each of them to read the exact conditions. If you find a campaign you think is relevant to you, you can bookmark it and this way get easy access to it through your dashboard. If you bookmark an offer, you will have easy access to it from your dashboard. 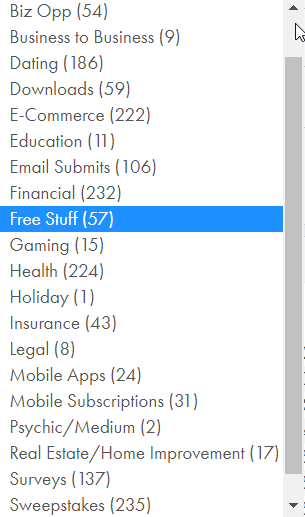 The bookmarking function makes it easy to browse through the offers and just add the ones you think might be relevant for you and then you can sort and find the exact offers you want to promote later. Once you have found the offer/offers you want to promote, you need to get access to them. One thing I like on MaxBounty is that there are many offers you are just automatically approved for once you are a member. This makes it very easy to get started. You are automatically approved for many offers. I have tried on some networks where you have to apply for every single offer and sometimes it takes more than a week to get an answer and that can really break the flow. So it is amazing being able to get access to many of the campaigns right away without further approval. However, it is not all offers you are automatically approved for. There are some, where the advertiser wants to approve every single affiliate before you can get access to the campaign. You will see this easily at the top of the campaign description. Here it is clearly marked if you need to be approved. Once you have been approved, or if you choose the offers you are automatically approved for, you then need the links you can use in your campaigns. They are automatically available in the campaign detail page for the offers you are approved for. So you just choose the relevant link for you and use it in your campaigns. When and how will you get paid? MaxBounty is in general quite user-friendly and has a good amount of offers. I also find that they pay relatively well for many offers compared to some other networks. For some offers, they pay more and for some offers the same or a little less than other networks. If you find they are paying too little for a specific offer, you can always talk to your affiliate manager about this.